A tender crumb flavored with fresh orange zest, studded with tart cranberries and topped with an orange glaze! I hope you like scones – because I have yet another scone recipe for you! A portable, dunkable and delicious scone with a glaze. The perfect accompaniment for your next cup of coffee or tea. I know you may be thinking “is she obsessed with scones or something ” and the answer is yes! It all began with a bunch of fresh blueberries and a few adjustments to a family scone recipe that resulted in a batch of these. Ever since than (as in a few months ago) I have been hooked. Baking up batch after batch of scones in various flavor combinations like today’s cranberry orange scones. A tender crumb flavored with a hint of fresh orange zest and studded with tart dried cranberries. Topped with a sweet orange glaze flavored with some freshly squeezed orange juice and a hint of orange zest. Making for the perfect sweet meets citrus combination. I think these would also be delicious with a few white chocolate chips added in with the cranberries. In a large bowl add the sugar and orange zest. Using your fingertips rub together the sugar and orange zest until fragrant and slightly damp. To the sugar mixture sift in the flour, salt, baking soda and cream of tartar. Add the butter and cut it into the flour mixture until crumbly and some pea sized pieces remain. Toss in the cranberries and stir to combine. Make a well in the center of the flour mixture. In a small bowl whisk together the buttermilk and egg. Add the buttermilk mixture to the flour mixture and stir until the dough just comes together. Do not over mix. With floured hands, transfer the dough to a lightly floured work surface. Pat the dough into a round with a 1-inch thickness. If the dough is a bit shaggy you can knead it 3-4 times to further incorporate the ingredients. Cut the dough into 8 triangles and space the triangles out onto a parchment lined baking sheet. Refrigerate the scones for 30 minutes. Once the scones have finished chilling brush the top of each scone with some heavy cream and sprinkle with some coarse sugar. Bake for 15 -20 minutes until firm to the touch and cooked through. Allow to completely cool. While the scones cool you can prepare the glaze. In a small bowl whisk together the confectioners sugar, orange juice and orange zest. Drizzle the glaze over cooled scones. Allow the glaze to set and enjoy! 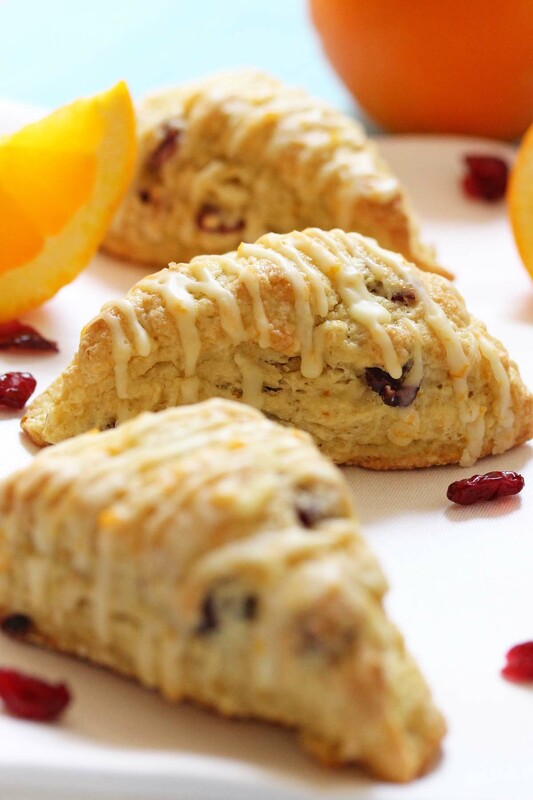 23 Responses to "Cranberry Orange Scones"
These look perfect! Scones can be tough, but it looks like you nailed it. Love the drizzle, too! These look so delicious and perfect! Scones are delicious, but I definitely don’t eat them nearly enough. I love the flavor combinations in these scones too. Yumm! This is my kind of breakfast! I love the drizzle! These look amazing! Your photos are so pretty! I haven’t made scones in so long, I need to change that! Oh my gosh!!! Great minds think alike! I was just thinking about making scones and these look so perfect. I am totally digging the colors in the photograph. Beautiful photos! Pinned! I love the flavor of these scones! Such a good fall flavor with the cranberries added in. And these would definitely go perfectly with my morning cup of coffee! 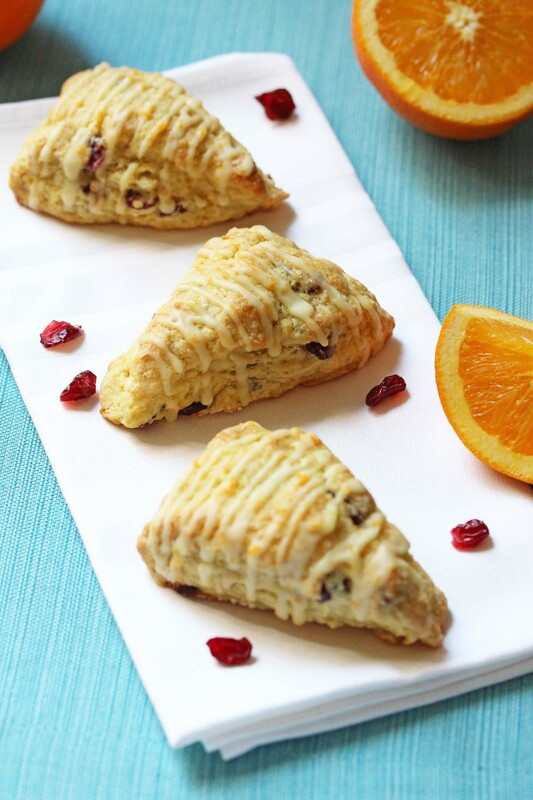 These look delicious, I love orange and cranberry together! I will definitely need to try these. Your photos are beautiful! Oh, boy, these look perfect to eat with my morning tea! I love the cranberry-orange pairing…delish! I love scones! I have never made a cranberry and orange flavoured scones before.. curious to know what they taste like. I need to recreate this recipe, they look delicious! Ooh I love cranberry + orange together, Ashley. These scones look picture perfect! These scones look so flaky and perfect! Cranberry orange is one of my absolute favorites!